The (von) Sand clan from Coburg/Germany is comprised of the descendants of “ancestor” Hermann von Sand I (c. 1220-1290) and his wife Adelheid, one-time landed gentry in the Franconian/Thuringian area near Sonneberg, both buried in Coburg’s Franciscan abbey; see Baron Klaus von Andrian-Werburg, Das Totenbuch des Franziskanerklosters in Coburg c. 1257-1525 (1600), Neustadt/Aisch 1990, pp. 45 (no. 132) and 71 (no. 235). 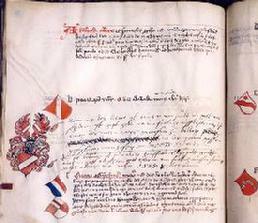 Starting from Eberhard von Sand II (c. 1360-1440) of Coburg, the generational sequence of the family is fully documented without gaps up to the present. During the 19th century, the clan split into a Frankfurt-Palatinate line (A) and an Erlangen-Wunsiedel line (B). In the 19th century, the latter divided in turn, leaving a Swiss branch in St.Gall (C, with 13 name-bearers currently alive); the three Bavarian branches of Ebnath (D, 8 living name-bearers), Regensburg/Ratisbon (F, now extinct), and Schwarzenbach (G, 49 living name-bearers); as well as two overseas branches which fell extinct in the 20th century, Surabaya (E) and New York (H). Among the members of the “Sand Clan” at large, there are numerous direct (consanguinous) descendants of the Coburg family who took on different surnames by marriage, while keeping their traditional family affiliation – including the British and Australian descendants of a Sand-grandson, Georg August Bruxner (1778-1863, see Henry R. Bruxner, The Vicissitudes of a Franconian Family: Erlangen to St.Petersburg, Argyllshire and the Clarence, London 1911, and Sir Michael Bruxner, A Family Record, Sydney 1966); the Dutch descendants of Anna Margaretha Sophie de Vogel née Sand (1824-1857, see Nederlands Patriciaat 14/1924, p. 361, and Dirk van Duijn, “Van Erlangen naar Soerabaja: Sand”, De Indische Navorscher 11/1998, pp. 49-54); the Swiss descendants of another Sand-grandchild, Lily von Muralt (1849-1921, see Leonhard von Muralt-Baumgartner and Hans Morf, Stammtafeln der Familie von Muralt in Zürich, Zürich 1976, table VII); and the French descendants of Marquise Elise de Cadoine de Gabriac née Sand (1868-1945, see Jean de Bonnot, L’Ordre de la Noblesse, vol. 7, Paris 1992, pp. 189 and 307). For details – with genealogical data, detailed bibliographic references to the earlier literature, coat of arms, and extensive illustrations – see the updated family chronicle edited by Peter H. Sand and Walter Sand, Die Familie (von) Sand aus Coburg (Munich/Bonn 2005, 397 pp.). There are, or were, other – unrelated – “Sand kinships” in various German-language regions, too (Eastern Prussia, Silesia/Lausitz, Rhine-Hassia, Western Palatinate/Luxemburg/Alsace, Lower Rhine/Westphalia, Upper Palatinate, Central Franconia, and Upper Bavaria/Tyrol). Yet, as far as documentary records go, neither of these appear to be related to the Coburg family. That also applies to the equally numerous bearers of a Sand surname in various Scandinavian, Dutch and English-language regions, as well as the descendants of the French writer, George Sand (pen-name of Baroness Dudevant née Aurore Armandine Lucile Dupin de Francueil, 1804-1876). There have been attempts at compiling those unrelated namesakes, in a so-called “World Book of Sand Families” (Halbert’s Family Heritage, Bath/Ohio 1991) and a similar collection of addresses, "Chronik des Sand-Geschlechts" (Steinadler publishers, Weinstadt 2005), though without any genealogical connection.